Whilst Alger and Dechamps have assumed that this document was the result of lessons given by Grand Maréchal Bertrand’s wife, Fanny Bertrand (the document was apparently owned by her), internal evidence in the letter would seem to be against this, as noted by Cahuet in his article. On the left margin of folio 1 stand the phrases: “Who has brought you this letter. Madame S[k]elton is then departed, J am very sorry of it, When will she come back.” With the exception of Lady Malcom and Mrs Balcombe, Madame Skelton probably saw more of Napoleon on St Helena than any other British lady. Wife of the Lieutenant governor and previous resident at Longwood, she spoke excellent French and dined and visited with Napoleon six times, playing chess with him on her last visit, 11 May, 1816. This period of favour corresponds perfectly with the moment when Las Cases was teaching Napoleon English. There is no mention at this period of Madame Bertrand having given similar lessons. Indeed, Bertrand’s diary of the St. Helena period begins in April 1816 and before this time relations between Napoleon and Madame Bertrand were enormously strained as she continually refused to come to dine at Longwood, preferring the social ‘excitement’ of Jamestown. Napoleon, on the other hand, was not to remain at the rudimentary level of mere sentences for long. On Sunday 28 January (a week and half after the previous passage regarding English lessons), Las Cases notes that Napoleon had continued to take regular lessons: “Our days passed,” he went on, “as anyone would imagine, in a gigantic and insipid monotony. Ennui, memories, and melancholy were our mortal enemies; work was our great, indeed our only refuge. The Emperor was exceedingly regular in his activities. English had become for him an important matter. Fifteen days earlier [in fact, eleven, ed.] he had taken his first lesson, and counting from that moment, a few afternoon hours every day were engaged in that study, sometimes with an application that was entirely admirable, sometimes with visible dislike; an alternation which made me particularly anxious. For I set the greatest store by his succeeding and I feared every day to see him abandon the efforts of the day before – that in the end I would be the cause of the greatest ennui and without the precious goal which I had set myself. But on the other hand, every day I was increasingly motivated, seeing my aim getting ever nearer. The Emperor’s acquisition of English was a real and significant victory. In the past, so he said, simple translations had cost him annually one hundred thousand ecus. Were his translators good appointments, he added? Were the translations faithful? Today we found ourselves imprisoned in the midst of this language, surrounded by its productions. All the great changes brought about, all the great questions which the Emperor had raised on the Continent had been discussed from the opposite point of view: there were so many new faces for the Emperor, which up to that point had remained for him inscrutable. Added to that, books in French were rare for us, and those that were available the Emperor knew them all and had re-read them until he could re-read them no more, whilst on the other hand we could get ourselves many books in English, books indeed which were completely new to him. To sum up, the acquisition of a foreign language became a quality in his eyes, it was not only an ornament in itself, but also a real advantage. It facilitated negotiations and in a certain way was the beginning of a relationship for both of us. Nevertheless, I was beginning to notice an end to our difficulties; indeed I could almost see the moment when the Emperor would go beyond the inevitable dislike of the beginning. But imagine if you can what it must have been like for him – the schoolwork of learning conjugations, declensions, articles, etc. It would have been impossible without huge effort on the part of the pupil and real skill on the part of the teacher. He often asked me if he deserved the cane, suspecting that it had a good effect in schools. He would have got on much faster, he used to say laughingly, if he had had a cane to fear. He complained that he had not made any progress – but the progress he did make would have been enormous for anyone. The larger, the swifter, the broader the spirit, the less likely it is to stop on detail, rules and minutiae. Despite the fact that he grasped extraordinarily easily the theory of the language, the Emperor had few gifts when it came to learning the mechanics of the tongue. He had an extraordinary intelligence but a very bad memory: (7) this latter particularly upset him. He felt that he was not improving. As soon as I was able to frame the words in question into a law or give a logical analogy for them, that law or analogy went in and was understood immediately. The pupil then would outstrip the teacher in the applications and consequences of the figure. But when it was simply a question of memorising and repeating mere words, it was a very difficult business. One word would be continually taken for another, and it would become too fastidious to enforce a strict regularity. Another difficulty was the fact that the same letters and vowels as in French required a completely different pronunciation: the pupil wished only to recognise our pronunciation: and the teacher would have doubled the problem of ennui if he had asked for more. j write you this letter for say to you that you had done a very good book. It is not however that is not somme fautes (8) but you schal may corect them (9) in the next edition: then schal you may sell you work five pound (10) every exemplary. upon that j pray god that he have you in his holy and worthy guard. “Count Las Cases. Since sixt week j learn the Englich and j do not any progress. Six week do fourty and two day. If might have learn fivity word four day I could konow it two thusands and two hundred. (12) It is in the dictionary more of fourty thousand; even he could must twinty bout much of tems for know it our hundred and twenty week, which do more two yars. After this you shall agrée that to study one tongue is a great labour who it must do into the young aged. Longwood this morning the seven march thursday one thousand eight hundred sixteen after nativity the yours (13) Jesus Christ. 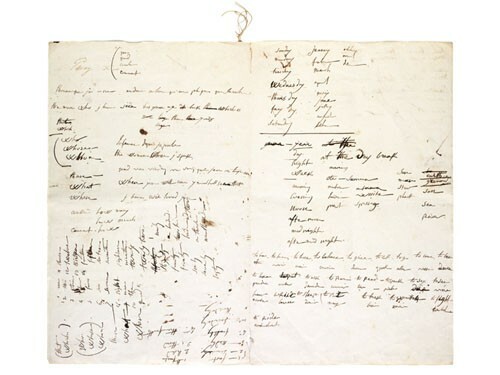 It is clear from the letters in the Las Cases papers and from that held at the Bibliothèque Nationale that Napoleon achieved a certain command of English. And though his spelling was ‘wayward’, to say the least, nevertheless improvments can be seen. In the Bibliothèque Nationale text, as the letter continues initial errors are corrected: sixt becomes six, konow becomes know, twinty becomes twenty, thusand becomes thousand. Indeed there are very few spelling errors in letters of 6 and 9 March. Furthermore, although the letters are at times hard to follow (when he says ‘to cause with you’, he means ‘to converse with you’, ’causer’ meaning ‘converse’ in French), the sense can in the end be divined. We can thus happily agree with Las Cases and say that Napoleon could indeed read and write English. However readers are left with the distinct suspicion that Las Cases is over-egging his cake when vaunting Napoleon’s success at speaking English, as in the story of 15 April, 1816, particularly since Las Cases himself told us that when speaking English Napoleon was almost completely incomprehensible (at any rate, to all but Las Cases). Betsy Balcombe too noted Napoleon’s strange way of speaking her language: “The Emperor’s English, of which he spoke a few words, was the oddest in the world”. (16) But this latter embellishment is in the end relatively unimportant. 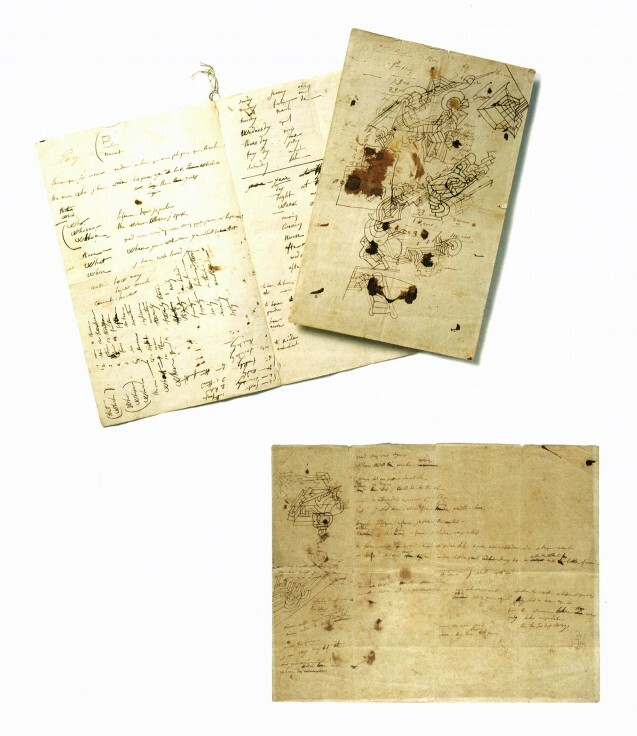 The documents in the Las Cases papers and that in the Bibliothèque Nationale prove that Las Cases’ account (in the Mémorial) of the spring of 1816 on Saint Helena, of the great man screwing his courage to the sticking point to learn vocabulary like a schoolboy, mispronouncing foreign words, but also finally becoming proficient in the language of his great adversary, is essentially a faithful account of events. (1) Emmanuel-Auguste-Dieudonné-Marius-Joseph Las Cases, Mémorial de Sainte-Hélène ou journal où se trouve consigné, jour par jour, ce qu'a dit et fait Napoléon durant Dix-huit mois, Paris: Las Cases, 1823. (2) Almost certainly incorrectly, Charles-Jean-François-Tristan de Montholon (Récits de la captivité de l'Empereur Napoléon à Sainte-Hélène par [un] compagnon de sa captivité et son premier exécuteur testamentaire, 2 vols, Paris: Paulin, 1847) placed these first lessons on 31 August, 1815, after the British vessel had left the island of Tenerife (“The Emperor wants to learn English – Count Las Cases gives him a first lesson.”). Montholon's memoirs should be read with caution, written as they were 20 years after the event when Montholon was languishing in prison in northern France, at Ham, with Napoleon's nephew, Louis Napoléon, soon to be Napoléon III. Such confusion is perhaps understandable in the light of Montholon's remarks concerning the state of his papers. When he was arrested (Montholon recounts), the police seized some of his notes and made such a mess that he was unable to find his records for certain days of the exile on St Helena. 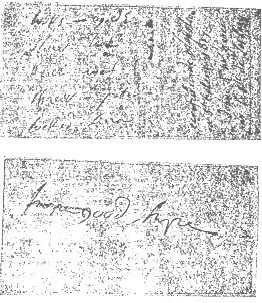 (3) Jules Dechamps, “A propos d'un autographe inconnu : Napoléon et la langue anglaise », in Revue des études napoléoniennes, XXe année, tome XXXIII (1931, July-December) p. 124-28, consultable on http://gallica.bnf.fr/. (4) Autograph manuscript, S.l.s.d. [Longwood, 1816-1817], two leaves, 8 sides Fondation Napoleon, Paris. Inv. 1153. (5) J. G. Alger, The Atlantic Monthly, November 1895, and another more detailed version of the same article in his book Napoleon's British Visitors and Captives, London: 1904, pp. 309-15; Albéric Cahuet, L'Illustration, 11 June, 1921, “Un devoir d'Anglais de Napoléon à Sainte-Hélène”; Jules Deschamps, art. cit. (6) Albéric Cahuet, art. cit. (7) Presumably on St Helena. Before this time, Napoleon had been renowned for his ability to retain facts. (8) "it is not" deleted. (11) BNF NAF 2003 folio 6 r°-v°, autograph letter by Napoleon in English given Las Cases to the “La Bibliothèque impériale” (i.e., the Bibliothèque Nationale of the Second Empire). 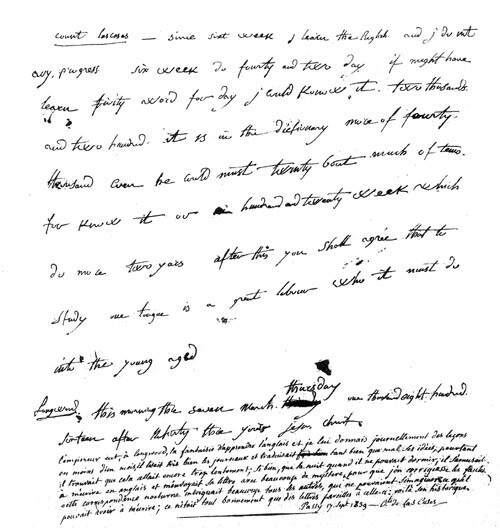 His notes upon it are dated, 17 September, 1839. The letter has in fact been in fact published in Léonce de Brotonne, Lettres inédites de Napoléon Ier, Paris: Honoré de Champion, 1898, letter 1505, p. 605-6, but with a particularly inaccurate transcription. (12) Napoleon's arithmetic is incorrect: 50 x 42 = 2,100. (13) This should read ‘lord' or ‘saviour'. Napoleon may have been trying to write ‘years'. (15) "sur ce je prie" deleted. (16) Mrs Abell, Recollections of the Emperor Napoleon during the first three Years of his Captivity on the Island of St Helena, 1844, republished by Ravenhall Books, 2005, under the title To befriend an Emperor: Betsy Balcombe's memoirs of Napoleon on St Helena, chapter VIII, p. 86.